Safe opening is our specialty! From fire rated boxes to bank vaults and everything in between! If you’re locked out, you need to give us a call today! Stubb Safe & Vault employs only the best! 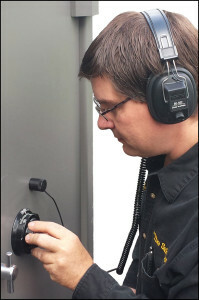 Our techs are Certified Master Safecrackers and know how to open your safe, the right way! We’ll save you time and money by opening your safe quickly and efficiently, which makes repairs easy and virtually undetectable. Every minute your safe is down is an inconvenience to you and potential revenue loss. Our technicians can, in many cases open your safe with non-destructive methods, such as safe lock manipulation and key lock picking. We utilize non-destructive safe opening methods whenever possible. Even if your safe needs to be drilled, our technicians are skilled in their craft and will professionally open your safe with techniques that, when repaired, are virtually undetectable. We’ll return your safe to a factory-like condition.